The indicator displays which Dual clutch transmission shift lever is selected. 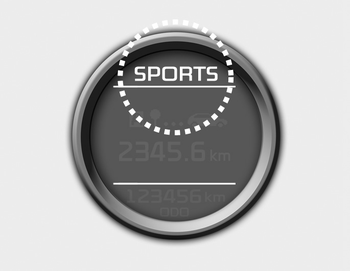 In DS mode, the “SPORTS” indicator displays in cluster. For more detailed information about DS mode, refer to the chapter 5. When the problem of gear system occurs, the transaxle indicator will blink. For your safety, we recommend that you contact an authorized Kia dealer and have the system checked. When the clutch is overheated, the safe protection mode operates. According to the safe protection mode, the transaxle indicator blinks with buzzer sound. The buzzer beeps 3 times. In this time, the LCD warning about safe protection mode also displays. In this condition, the driving may not be smoothly. If you ignore this warning, the driving condition is getting worse and the system may have problem. To return the normal driving condition, apply the foot brake and stop the vehicle for few minutes before driving off.